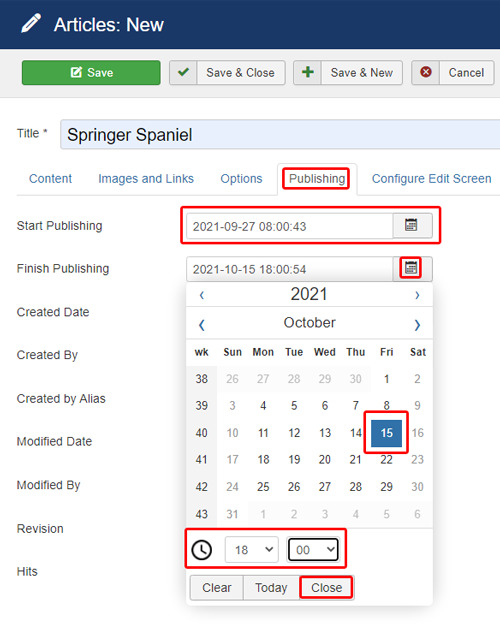 Set the Start Publishing and Finish Publishing Dates. This will cause the article to only be published for the specified time period. The scheduling of articles is not limited to just the back-end administrator's panel. It can also be completed via the front-end administrator's panel as well. Not setting either area means that the article will always show up until you either turn if off or delete it. If you only set the Start Date and not the Finish Date, then Joomla! will begin displaying the article on the beginning date given but it will never stop showing the article until you either turn it off or delete it. If you only set the Finish Date and not the Start Date, then Joomla! will show the article as soon as you have turned it on and will stop showing the article once the ending date has been reached. If you use both the Start Date and the Finish Date then the article will show up only between the beginning date and the ending date. If you set the Start Date after the Finish Date then the article will never show up. So if you have created articles and they are not showing up, please check your Start Date and Finish Date settings to ensure sure you have not done this. This page was last modified on 6 November 2017, at 04:35.